This weekend, Mo Pop Festival will bring over 20 awesome acts to West Riverfront Park in Detroit. 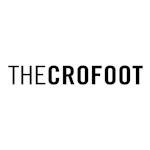 Now in its sixth year, this festival has featured big name national acts like Modest Mouse and Foster The People, with local and independent artists like Flint Eastwood and Stef Chura. This year, the fest has a packed lineup, with Bon Iver and The National headlining the event. Also on the bill are Portugal. 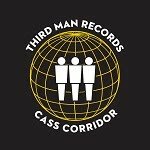 The Man, St. Vincent, Vince Staples, Highly Suspect, Brockhampton, Daniel Caesar, Billie Eilish, Alvvays, Turnover, Rex Orange County, Dermot Kennedy, Homeshake, Jeff Rosenstock, Clairo, S. Carey, Joe Hertler & The Rainbow Seekers, lovelytheband, Empty Houses, Shortly, and Curtis Roach. This will be two amazing days of music that you definitely don't want to miss! 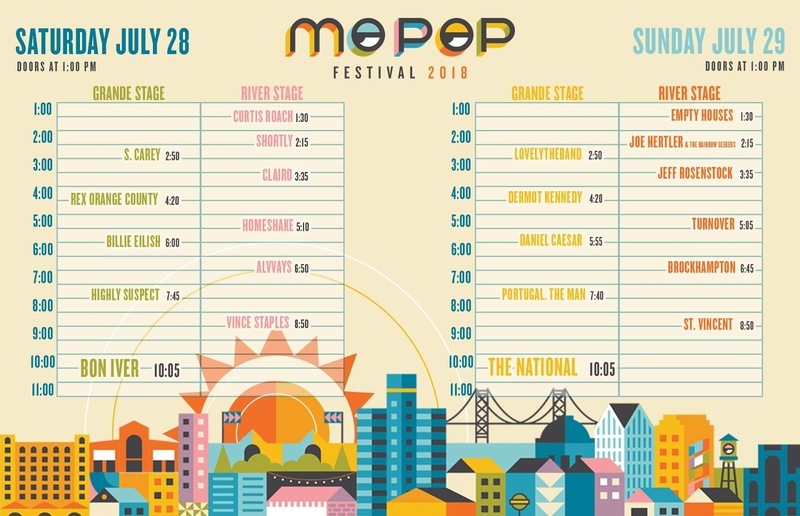 Mo Pop 2018 will be taking place on Saturday, July 28th and Sunday, July 29th. 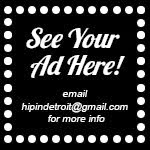 Tickets for the festival are $145 for the weekend or $95 per day. You can purchase your tickets in advance here. In addition to all of the great music at Mo Pop, there will be small "villages" set up throughout the festival with all sorts of fun features. For example, The Mo Arcade is an air conditioned tent featuring arcade games from Offworld Arcade, along with contests and DJs. There will also be artists, vendors, craft beers, and a food truck alley with some delicious eats! Festival gates will open at 1 p.m. each day, with the first act hitting the stage at 1:30. Curtis Roach will kick the festival off on Saturday, and trust us when we say that you don't want to miss his set! Check out the full schedule for the weekend below. 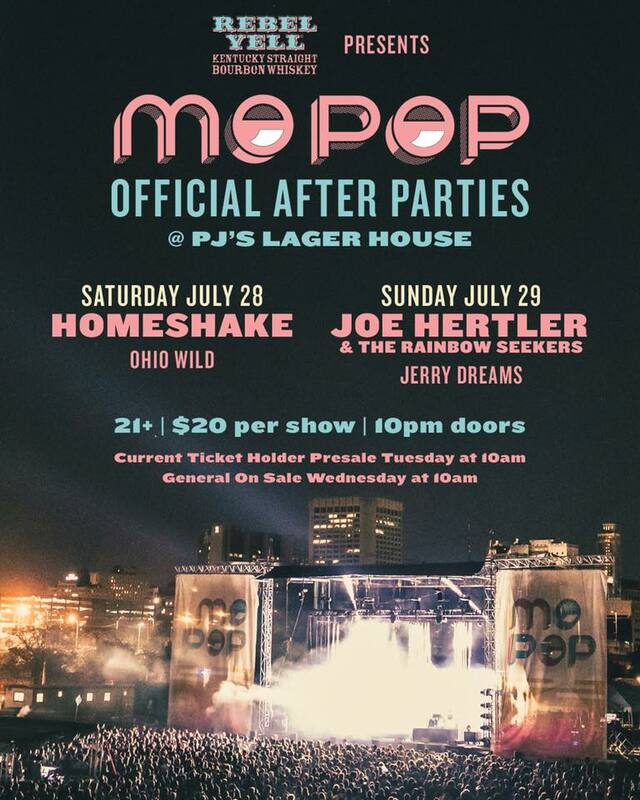 And whether or not you can make it to Mo Pop this year, make sure you check out the official Mo Pop After Parties happening both nights at PJ's Lager House. Saturday night's lineup will feature Homeshake and Ohio Wild. Joe Hertler & The Rainbow Seekers and Jerry Dreams will play on Sunday. Cover for each night is $20 and 21+ are welcome. For more info on Saturday's after party, click here. For info on Sunday's after party, click here. 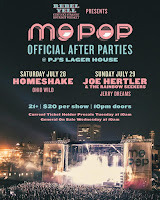 For everything you need to know about Mo Pop and the After Parties, head over to MoPopFestival.com.